Beyond Hurdles | News and Features | Style Weekly - Richmond, VA local news, arts, and events. Soon after Kellie Wells turns 30, she's going to walk onto a track in London, get in the blocks and do her best to be an Olympic champion. It's been a long road to the 2012 Olympics for Wells, a former standout at James River High School in Chesterfield County and at Hampton University. An injury sidelined her for the 2008 Olympics. Before that, she survived what she calls years of sexual abuse by her mother's boyfriend, followed by the death of him and her mother in a horrific car accident. In recent years Wells has fought her way back to the top. 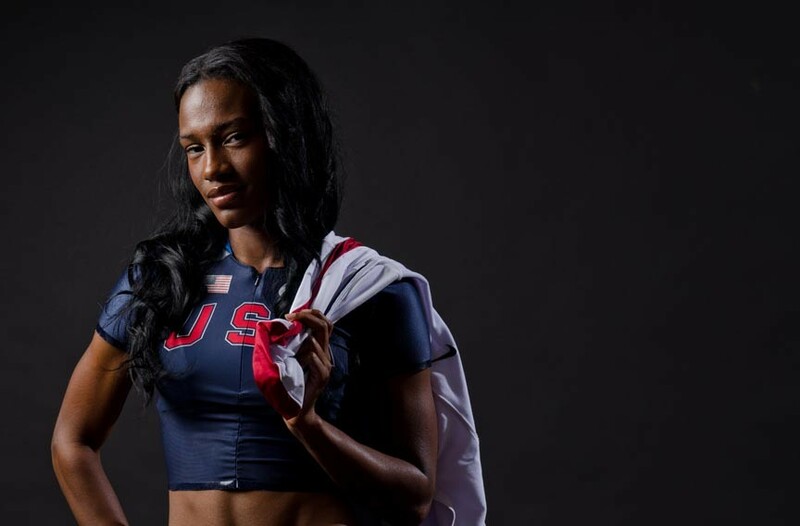 She had the world's fastest indoor women's 100-meter hurdles in the country last year with 7.79 seconds, and this year placed second in the Olympic trials. On Aug. 6, she'll represent the United States in the 100-meter hurdles at the 2012 Olympic Games, three weeks after her birthday. She speaks often about her own trials — people want to hear how she's moved beyond the setbacks and the pain to become a champion. She chatted with Style Weekly recently from her training grounds in Florida, just before catching a plane to the Olympics. Style: Running hurdles has been described as three steps and a jump. What's it feel like when you're doing it? Wells: I'm thinking about the run, basically. I don't really jump — it's more like an acceleration. It's kind of like the first part is going uphill, the second part is going downhill. I'm not totally zoned out, but I'm not really thinking of each movement either. How are you feeling about the Olympics? Last time must have been so disappointing. I'm a bit more mature this time, and I know how to handle things better on and off the track. I'm healthy, so that's good. I'm going to look at it as another meet. I'm on-task and keep moving forward. You have spoken about the unhappy aspects of your times growing up, for example in a detailed feature a few months ago in Runner's World magazine. What happy memories do you have of your time here? I have so many good memories! Dance class. Summer theater. High school was a lot of fun, with show choir and track. I was really active. It makes me smile to remember it. Sure. I'd sing. You know, musicals. Show tunes. How does it feel to be told you're a role model for people who've suffered abuse? I've chosen to show a lot of myself, because I want people to know. … You don't have to give up just because something bad happens. You can keep going. What would you tell someone who's going through what you did as a child? Tell someone immediately. If that person doesn't listen, don't give up, tell someone else, someone else, until someone listens. Don't hold it in. What should people know about hurdles that they don't know? You never know what will happen. We have 10 33-inch barriers of fiber to get past. So the fastest girl isn't always the winner. Anything can happen in a hurdle, so that's what makes it so very exciting. Anyone you'd like to give a shout out to locally?